A dental implant is a replacement tooth that is placed into the mouth to support a fixed restoration like a porcelain crown, bridge, or even a full mouth denture. 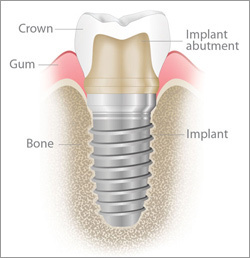 The actual implant itself is an artificial tooth root that is most often made of titanium and is placed into the mouth where the tooth is missing. Many of our patients come to us because they are unhappy with their dentures. They may be loose, difficult to speak with, or even make it impossible to eat their favorite foods. With an implant-supported denture, Dr. Mathias is able to provide a secure, streamlined denture that provides the stability and function that you deserve. The dental implant process is more involved than any other type of dental treatment, but it is also one of the longest lasting types of dental therapy that DeLand Smiles has to offer our patients. The first part of the process is to determine whether or not you are a candidate for the treatment – our patients should be fairly healthy with adequate bone levels to support the implant. A 3D bone scan here at our facility will help us determine whether or not you are a candidate, as well as assisting in the placement of the prosthesis. Once the artificial root is placed into the mouth, we will allow the area to heal for several weeks. During this process new bone forms around the root to secure it in place. If necessary we will place a temporary tooth in the area so that our patients do not have to go without their teeth. After full bone healing has occurred, we will place the final prosthesis on top of the implant – such as a crown, bridge, or snap on denture. We invite you to call our office or come by for an exam with Dr. Mathias to find out how dental implants can help you improve your smile and your life. Call us today.